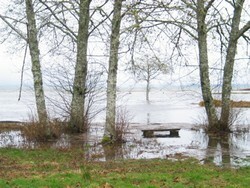 Oysterville is situated at the northern end of the Long Beach Peninsula, on the edge of the Willapa Bay, a wide, shallow saltwater expanse known for its biodiversity. The village is shaped by the natural environment: by its serene vistas and dramatic weather, by the ebb and flood of tides and migrating birds, by the sound of the ocean breakers just a mile away, and by the diverse wildlife who nest and hunt in its waters, along its shores, in its open and thicketed wetlands, and in its stands of evergreens. Although ORF's primary concern is preservation of the church, we also extend our stewardship to the natural environment that has so much to do with the history and character of the village. ORF owns and maintains several parcels of open land, including "The Meadow", a wide, open green space on the bay side of Territory Road that is home to many indigenous species of plants and wildlife. Our care of these parcels includes periodic mowing, occasional thinning, management of noxious weeds in cooperation with County officials, and preservation of landmark trees. In an effort to restore Oysterville's streetscape, ORF led the effort to replace unsightly overhead power and telephone lines with underground wiring. 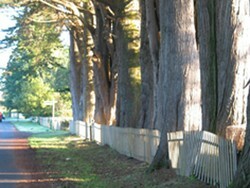 Of continuing concern is the on-going health of the village's majestic Monterey Cypress trees. In conjunction with property owners and certified arborists, the ORF has worked to assure the health and longevity of the trees, said to be the most impressive stand of Monterey cypress outside of California.